Comments: The De Havilland Vampire was Britain's first operational single seat, single engined jet fighter. Designed during WWII, the war ended before the first versions could see operational service against the Luftwaffe. Typical of De Havilland, the Vampire was mostly wood, except those areas affected by the heat of the jet engine. 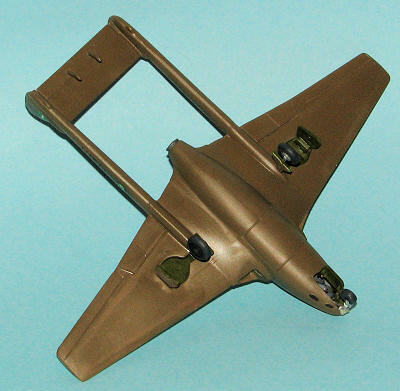 The Vampire is an especially small and compact aircraft with little in the way of avionics or other current amenities. This made it relatively easy to maintain and allowed a number of foreign air forces to quickly join the jet age. Among those was Rhodesia, who were probably among the last to operationally use the Vampire single seater. Now on to the kit. For those of you who remember or who have built Frog kits, will not be surprised by this one. As with most Frog kits, what you get is a basic shape and lots of opportunity to add your own touches. The panel lines (what few there are; this is a wooden aircraft) are raised and the control surfaces are engraved. There is no wheel well detail and the cockpit consists of a seat shape, floor, instrument panel and control stick. The canopy is quite thick and distorted so there is really no need to do any detailing of the interior unless you replace the canopy with a vacuform version. The trickiest part of the building is getting the booms properly aligned with the rest of the kit. I had some success, but it isn't as nice as I would have hoped. The plastic in these Frog kits is very thick, and this invites sink marks of which there are many; mostly on the wings and fuselage. There are no splitters in the wing intakes and the exhaust stops about 1/4" back. The undercarriage is quite basic with main wheel that are generic at best and snap on. There is no attempt to duplicate the Vampires interesting nose wheel tire (a dual tread job like the Mosquito tail wheel), nor are there any actuating struts. The gear doors are extremely thick, and the elevator counter-weights probably scale out to be the size of watermelons!! All said and done, the kit is quite sturdy when finished and can withstand a lot of abuse, a trait that is typical of Frog. What I wanted to do, was build a Vampire of the Rhodesian Air Force during its long civil war. This was additionally assisted by Scale Aircraft Modelling's first decal sheet back in the early 80's. This included several different versions of Rhodesia's national insignia in a myriad of sizes. I especially wanted to do one with the Rhodesian lion, but only the smallest o nes were in register. Fortunately, these were perfect for the tail boom of the Vampire, and I only needed two. The canopy was masked off , cannon ports drilled out, and the entire airframe was painted RAF dark earth brown. Once that was dry, the upper surface camouflage of RAF dark green was sprayed on. A very simple but effective scheme for the bush of Rhodesia. Being one of my earlier spray jobs, it is not very precise! Once that was dry, Future was sprayed on and it was time for the decaling. This was simple to the extreme as the scheme included only two boom insignia, four fin flashes, and the serial for the tail booms. Insignia from the SAM sheet, fin flashes from a solid green sheet with a single white stripe from a Scalemaster sheet, and the serial numbers from a Modeldecal sheet. That's it. No under or upper wing decals; no unit markings; no pilot names. The Frog kit is not the best Vampire in this scale as it is easily bettered in all areas (except simplicity) by the Heller kit. But it does make for a quick build, and if you are looking for some relatively relaxing modeling without sweating contest quality, these old Frog/Novo kits are a cheap and easy way to fill a shelf. You'll also notice that unless nose weight is added, it is a tail sitter. I had to add even more to the nose gear well to keep it on all threes.